A former coworker turned 40 last week; the celebration gave me a much needed nudge to try Amy Butler’s charm clutch pattern. I anticipate making many, many more of these with what I learned after the first go-round — including one for me, with vintage trim I tucked away for the perfect project. And speaking of fabric, I found several yards of what I think is African fabric at Goodwill the other day. It’s brand new and labeled “COLLECTION LAKING,” with a torn sticker that says “Knights.” I took some pics to send you and if you’re interested, I’ll snap it up and mail it to you. E-mailing pics now! 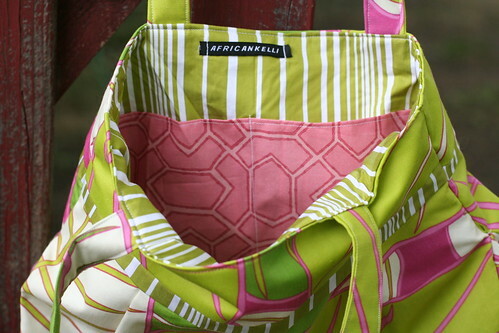 Tell us your sewing secrets that you learned! 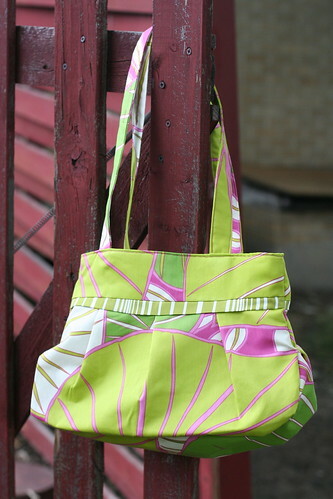 A larger version of this would make an awesome diaper bag! Nice work. It’s gorgeous!